The play is dominated by Richard the hunchback Duke of Gloucester who becomes King Richard III but only through a series of horrible acts, killing off his enemies, his kinsmen, his wife and most of his supporters before reaching the Battle of Bosworth and crying out "My kingdom for a horse." Richard is portrayed as a pure, self-professed villain of monstrous proportions. His evil drives the plot, and until his final defeat by the Duke of Richmond (who became Henry VII) in the play's last act, the good forces opposing him are weak, splintered, and easy prey for his schemes. there was a huge demand for new entertainment and Richard III would have been produced immediately following the completion of the play. It is believed that the script was first printed in 1597. As William Shakespeare clearly did not want his work published details of the play would have therefore been noted, and often pirated without his consent, following a performance. The play type is categorised as History. 'A horse! A horse! my kingdom for a horse!' and 'Now is the winter of our discontent'. Details of these famous quotes follow, complete with information regarding the Act and the Scene, allowing a quick reference to the section of the play that these quotations can be found in. Please click here for the full text of the script of the play. "Now is the winter of our discontent". (Act I, Scene I). "A horse! a horse! my kingdom for a horse!". (Act V, Scene IV). "So wise so young, they say, do never live long". (Act III, Scene I). "Off with his head!" (Act III, Scene IV). This is the last of the four Shakespeare plays to focus on the Wars of the Roses between the houses of York and Lancaster. The others were Henry VI, Part I; Henry VI, Part II; and Henry VI, Part III. Richard III (1452-1485) the last Plantagenet fought against the first of the Tudor monarchs and was therefore labelled in the Tudor histories as a vicious usurper, and he duly appears in Shakespeare's plays as a murdering monster. Shakespeare therefore presents him as one of the most evil rulers in history . However, the historical King, though unscrupulous, was not as ruthless as depicted and neither is there any evidence to indicate that he was a hunchback. After his brother, King Edward IV, died in 1483 Parliament declared Richard king instead of Edward's young son on grounds that Edward's marriage to Elizabeth Woodville was illegal. 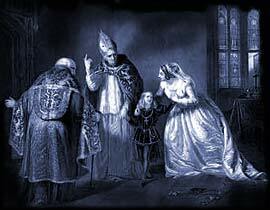 To secure his position as king, he confined both of the little princes to the Tower of London, where they were later killed by being smothered to death. There is no proof that the King ordered them killed but the public turned against him in favour of Henry. Armies of Richard and Henry fought at Bosworth Field in 1485 and Richard died bravely. Henry succeeded to the throne as Henry VII and the Tudor dynasty began. Holinshed's The Chronicles of England, Scotland and Ireland by Raphael Holinshed The Union of Two Noble and Illustre Families of Lancastre and York, by Edward Hall and The History of King Richard the Thirde, by Sir Thomas More (1477-1535). The work has inspired other works including films starring such actors as Ian McKellan and Laurence Olivier. Al Pacino Examines the man in Looking for Richard. Click the link at the top of the page to access a list of all the cast and characters of Richard III.